When you give your dog a bath, you will almost always end up with water in their ears. It can also happen when your dog goes swimming. Your pooch will show his discomfort by shaking his head and rubbing its paws on the sides of its head. So what do you do about water in dog's ear and is it something to be concerned about? Is it common for dogs to get water in their ears? Yes, it's pretty common – dogs can get water in their ears just like humans and with their longer ear canals it can be harder to get all the water to drain. Depending on the situation, water in dog's ear can become a health problem. Sometimes they need a little help to dry them out to keep from getting ear infections. Your dog's ears are very sensitive and are prone to a variety of health problems, but often overlooked by pet owners. Most dogs require regular cleaning of their ears to prevent these issues. Breeds with long ears like Beagles or Basset Hounds especially need extra attention. Cleaning dog ears out after bathing and swimming are good routines to get into. But this also means the risk of water in dog's ear. Can Dogs Shake It All Out? Here's everything you need to know about the dangers of water in dog's ear, how to prevent it and what to do about it in case it happens. I will also include instructions on how to clean your dog's ears, especially when it comes to bathing and drying water in dog's ear. Dogs do shake their heads to get the water to drain out of their ears, and usually do a pretty good job of getting most of the water out. However, depending on how much water got into the ear as well as the ear type (i.e. breed), not all dogs will be able to shake all the water out of their ears. Most dogs' ear canals are very long (2 to 4 inches) and have a right-angled bend. This creates an area where if foreign material or excess water gets in, it can pool or be difficult to remove. Bathing or swimming is when this happens most often, and at this point, pet owner's interference is necessary to remove water in dog's ear. The common danger of water in dog's ear is ear infections and fungus. If water isn't removed, it creates a perfect place for bacteria to grow – dark, warm, and moist environment. The dog's ear canal is a perfect set-up for trouble if not cleaned properly. It's easy to overlook excess water in dog's ear. As a result, some dogs will battle ear infections and it is hard for them to let you know. Ear infections are painful for dogs, and can eventually lead to loss of hearing. If it gets to that point, you'll need to use some type of dog ear infection treatment, but professional's help may also be necessary. Getting immediate care from your veterinarian is the best course of action. Your vet will recommend a course of treatment that will most likely include antibiotic medications as well as ear cleaners. Follow the directions to the end, as the full course is required to make your dog better. If your dog regularly battles ear infections after swimming or bathing, then ask your vet about which drying ear cleaner is preferred. If you notice that debris and regular cleaning isn’t getting your dog’s ears clean, you will need to take your dog in for a check. Some dog ear cleaners are designed specifically to be very effective at drying out water in dog's ear and evaporating quickly – these two mentioned below are the most commonly used by pet owners. 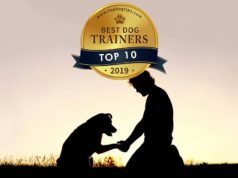 Later in this article I will also mention “regular” dog ear cleaners that are not as quickly-evaporating, but are more effective at cleaning dog's ears. This solution is good for somewhat dirty dog ears that do not require thorough cleaning. It contains many natural ingredients, so it won't irritate the ears, and it helps to dry water in dog's eat, evaporating quickly. However, it also won't be as effective at removing all of the dirt and debris in dog's ear, especially if you haven't cleaned the ears for a while. It's best to use it in combination with a proper dog ear cleaner, like Zymox Otic (mentioned below). If you want to spend a few extra dollars, you can get the kit that includes a combination of the above mentioned dog's ear drying solution and proper dog ear cleaner. This one is very cost-effective and will last a long time. However, if you can spend a few extra bucks, I would personally recommend to stick only with Dry Ear Relief solution as your drying option and pick Zymox Otis as your ear cleaner, simply because it's more effective, and is often used by veterinarians and owners. You can use pretty much any cotton balls or wipes to clean your dog's ears and then dry off water in dog's ear. If you don't mind spending a little extra cash, then these dog ear cotton wipes can be very helpful as they also contain a few solutions to keep your pet's ears cleaner, drier and smell nice. Note that while the manufacturer claims that these will also effectively clean the dog's ears, it's unlikely to be true based on the ingredients they use. It's most likely not a very effective dog ear cleaner, and should mostly be used to dry water in dog's ear instead. Cleaning your dog’s ears is an essential part of overall grooming. If you often find problems with water in dog's ear, then there are a few things you can do to prevent water from getting into your dog’s ears before giving him a bath. I'll go into more details on dog ear cleaning later in the article, but in short: take a large cotton ball and block up your dog’s external ear canals before bath time. Take them out after, and your Fido most likely will not let you forget to take them out. After bathing, using a lightly moistened cotton ball or cloth, wipe out much of the external ear canal as possible, then dry. Professional groomers note that you could go as far as one knuckle on your finger to be safe. Even though your dog’s ears are much longer and deeper than ours, DO NOT use cotton swabs (Q-tips) on your dog’s ears – it's too dangerous because you can damage his ears. See our full guide with video and photos on how to clean your dog's ears. Above I've mentioned cleaners that are designed to keep dog's ears dry; those are best for dogs that have serious problem with water in ears. There are also commercially available “regular” dog ear cleaning solutions. Most of them use witch hazel as a pure drying option. These formulas are more effective at cleaning but less effective at evaporating; they clean the debris and prevent ear infections in dogs. Any dog ear cleansers should be applied with just a few drops then massaged gently into the dog's ear canal. You can then use cotton balls to wipe out the excess liquid. The commercially bought dog ear cleaners will contain ingredients that are designed to ease itchy ears, remove wax build-up, and treat ear mites and yeast. 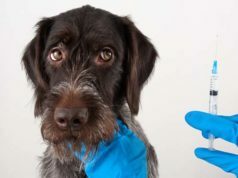 Most of these products are very effective and safe for dogs, but you can also consult with your veterinarian about which dog ear cleaner is best for your specific pooch. 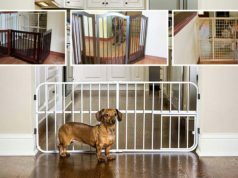 There are, however, homemade cleansers that work just as well as some of the commercially available products, and you can even make your own homemade dog ear cleaner. You will need a good supply of towels. If your dog is wet from swimming or bathing, his coat will need a good towel dry. Give your Fido a good drying using a pet towel all over and brush out his coat. It’s a good habit to get into not neglecting the little things like your dog's eyes and ears when getting your dog dried after grooming and bathing. Check your dog’s eyes for any discharge or tear stains while you towel him off. Healthy eyes are bright and clear, and checking them now is the right time to do it. You should already be cleaning your dog’s ears at least once a month, so your dog will be comfortable with you handling his ears and getting them clean. After towel drying your dog, you can spend some extra time checking for water in dog's ear and drying them. Your Fido is likely to dislike the process, so learn how to keep your dog calm while grooming and getting him ready for ear cleaning. Start by towel drying the ears, and soak up as much moisture as possible on the surface and around the dog's ears. Do not insert the towel inside your dog's ear; only use it for external drying. If there is still excess water in dog's ear (and it's likely there is), this is when you dab along the opening of the ear canal with a cotton pad. The above procedure should get your dog prepared for ear cleaning. Follow the below step-by-step guide on how to clean your dog's ears and dry them off. After swimming or after you've bathed your dog, using a big fluffy towel or a special dog towel, dry your dog’s ears as gently as possible. Lift up floppy ears, and dry both sides, top and bottom, but never let the towel enter the ear canal. After drying the ear thoroughly, use an ear cleaning solution in the ear canal. Apply a few drops as recommended. 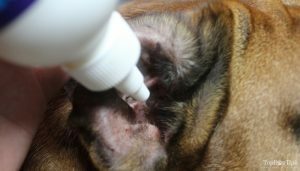 If you are using a home-made solution, use an eye dropper to measure out the solution as you drip it into the dog's ear. Be careful not to force the tip of the bottle or dropper far into the ear canal. This may or may not be your dog’s favorite part, but you should massage the base of your dog’s ear for a few minutes to distribute the cleaner throughout the ear. Stand back. Give your dog some distance so he can shake his ears. As your dog shakes his head it will dislodge any debris that is deep in his ears. Do this outdoors or in a bathroom where the mess is easier to clean up. You may need several cotton balls. After the shake, take those cotton balls and wipe the inside of the ear to soak up any additional liquid. Do not push hard into the ear canal, but rather pat and allow the cotton to soak water in dog's ear. If your dog suffers from dry skin, once the ear is completely dry, you can take the last cotton ball and dip it in mineral oil and lightly clean off the inside of the flap of the ear. This will additionally cleanse, but also provide moisture to the skin. Do the same with a second ear. We all try to save a little money at times and some of us just prefer natural ingredients as opposed to chemical products. There are recipes for homemade dog ear cleaners that you can use, and I've mentioned this one already. Generally, the recommended options are to use equal parts of hydrogen peroxide, witch hazel, or apple cider vinegar with purified water. Alcohol is not recommended because it burns, dries the skin and causes irritations in dog's ears. Many people have great success with the apple cider vinegar option. As for the smell, it disappears after it evaporates. The important part is that it keeps your dog’s ears clean, healthy, and dry.